Everything you need as an exempt preparer to qualify for the IRS Annual Filing Season Program (AFSP)–Record of Completion for the 2020 tax year! 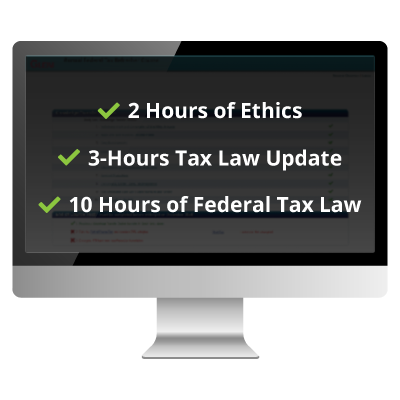 The Gleim AFSP 15-Hour CE Bundle for AFTR-Exempt Tax Preparers includes 5 courses. This CE Package should be used by certain exempt individuals who wish to obtain an IRS Annual Filing Season Program (AFSP)–Record of Completion but are not required to take the AFTR Course. If you have passed the RTRP exam or Part 1 of the EA exam, or you meet any other requirements for exemption, this bundle will provide you with all 15 CE credits necessary to qualify for the AFSP–Record of Completion for the 2020 Filing Season. This Bundle includes multiple online courses, providing you with the credit required to comply with the IRS requirements for the 2020 Filing Season. You may access these courses from any computer or mobile device that has an Internet connection. Courses must be completed by December 31, 2019, to count toward your 2020 Filing Season requirement. You can retake final quizzes as many times as necessary to pass. CE credits are reported weekly to the IRS.